Since the introduction of Do-Not-Disturb service across all GSM Networks in July, 2016, there has been lots of complaints by many GSM subscribers. The bulk of these subscribers had DND activated on their lines by the GSM operators without their consent. 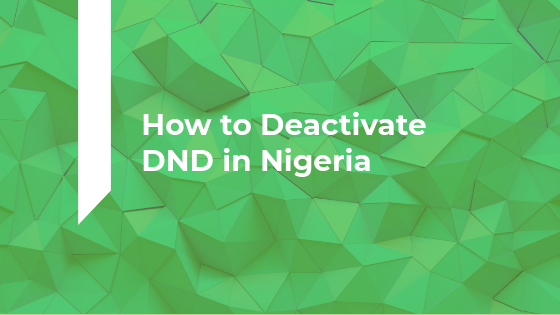 An attempt to deactivate DND from their lines with the normal codes provided proved abortive because the system returns a response saying the lines are not on DND. In this case, the simple work around is to manually activate then deactivate DND from the line. Below is a list showing the various DND Deactivation codes for the GSM networks. For GLO lines, text ALLOW to 2442. For MTN lines, text STOP to 2442, then text ALLOW to 2442. For AIRTEL lines, text STOP to 2442, then text ALLOW to 2442. For GLO lines, text STOP to 2442, then text ALLOW to 2442. For ETISALAT lines, text STOP to 2442, text then START to 2442. To check the status of your phone number you may kindly text STATUS to 2442. If you are still having issues, you can contact your GSM network for further help.